When preparing your home, it is best to think of yourself as a prospective homebuyer. From that perspective, you can better analyze how your home compares to the other houses that will be competing for prospective buyers’ attention. Most buyers form their first impression of your home before they even get out of their cars— sometimes from just seeing the photographs online. In a competitive market, making a great first impression is essential to selling at the highest price possible. To sell for the highest price, your home must be in pristine condition. Potential buyers form their first impressions of your home as they pull up and park at the curb. This is known as “curb appeal.” The view from the curb, tells a buyer how attractive and well-maintained your home may be, compared to other houses. This takes more than trimming the hedges and planting a few flowers. It is crucial to give the buyer a positive expectation of what they will see inside. When someone likes the exterior, they will be predisposed to also like the interior and you’re that much closer to selling your home. To see what needs to be done to create curb appeal, go outside, stand on the curb and take a look at your home, critically, the way the buyer will. Here are some areas to consider. Walkways should be swept and clear of leaves, weeds, and debris. Repair or replace cracked steps or pavers. Driveways should also be clear of vehicles, toys and debris. Park the cars in the garage. Walkways should be clear and unobstructed by tree limbs and shrubs. Prune trees and plants. Weed flower beds and replace withered landscaping with fresh plants and flowers. 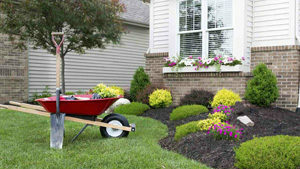 Lay fresh mulch in flower beds and planters. Remove trash, debris, and any other non-essential items. Repair or replace damaged fence panels and posts. Keep trash cans out of sight, or in the garage if possible. Keep your lawn mowed, edged and watered. 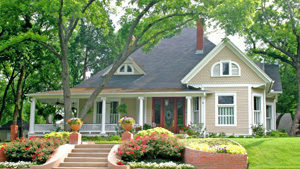 Replace loose or damaged roof shingles and clean out the gutters. Repair broken window panes and screens, and re-paint the trim. Replace mailboxes, light fixtures, or any other fixtures that looks less than fresh. Pressure wash siding, brick, windows, and porches. Paint or replace furniture such as benches, rocking chairs or porch swings. Repaint the front door with an eye-catching color that complements the rest of the exterior. Popular front door colors that add appeal are black, blue, red, turquoise. Replace dirty, tarnished, or scratched door knobs. Put out a new welcoming doormat. Backyard appeal is important because it sets the tone for how the buyers see themselves enjoying time off with family and friends. If the home has a welcoming backyard with an outdoor living space, the buyer will be able to imagine themselves using and enjoying the space— making the home more appealing. Your backyard should have a focal point. If yours doesn’t, consider creating one. 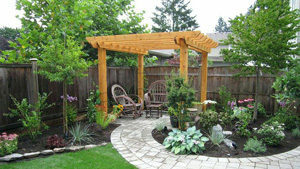 Some affordable weekend project ideas that can add substantial value are, building a pergola, a water feature, or a fire pit with gathering area. The pool should be sparkling clean. Make sure the pool deck is swept and cleaned. Consider pressure washing the deck. Pool furniture should be clean and inviting. Add new cushions with an accent color that pops. Coil or remove hose pipes, use a decorative pot or container for storage. Overall, some parts of your home may require more work than others, but it’s well worth it to get buyers eager to see what’s inside. Your agent will help you determine which projects will add money to your bottom line and which projects may not offer the expected return on value. Remember, to sell for the highest price, your home must be in pristine condition. Have questions? Need help preparing your home for sale? We are here to help.